When I took these off 4 years ago, I was in such a fog that I could barely string 3 words together. I stuck them in a box because I didn't know what else to do. I sort of forgot about them. Later I considered giving them to my daughter. The history of our relationship is important to her; she's always asking me to tell her stories of when we were dating. She was so young (they were 2-4-6) when their dad left. I could see her eyes filling up when she saw them, and then I felt bad, like I'd just shown her a dead animal. Horrible. She said maybe we should keep them. I said no - someday if you want to get married you'll have your own. I never know for sure if I say the right things. I know that she needs to let go of some burdens, but I also know that kids always wish for their family to be whole. It's a balancing act between respecting feelings & acknowledging that wounds leave scars, and acceptance/moving forward. We talked about what the money will be used for - so we are okay now. I think. I was in a mad scramble to sell off anything of value, but the list was short. I can't sell my tools! Now I'm at the end of my resources. I don't have any other jewelry. My 401k isn't big enough to wipe out; I'd lose so much in taxes that it wouldn't help me. I am resisting the urge to do illegal things for profit. So. The start date for building is not clear yet. The next step belongs to God. Praying that the Lord will provide a way for you to make the next steps. Things happen for a reason and selling those rings might be really good for the soul! Sell them! She'll understand the hex on them when she's older. I've still got mine in a box in a drawer too (his too). Its been almost 3 years since it was technically "over". I can't give them up yet but I really think I will someday. Sell 'em! They're a symbol of something that isn't there anymore. You guys deserve to have a new start. Now, I didn't pay attention to this part when we were doing the Financial Peace University through our church last year (401K is one of his few responsibilities) but there's a way to get money from your 401K without wiping it out and paying taxes. Look into it, see what it is. I just can't remember and it's entirely possible that I'm mixed up. The photo of Frodo cracked me up. 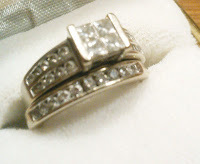 :) But, I know that giving up those rings feels awkward and unnatural. My (then) 3 year old daughter dropped my band down the air vent and it was never seen again (I admit I didn't try to dig it out). And then, I finally sold the engagement ring. I don't miss it. Not one bit. :) Great writing, friend. M.
I'm sorry that funds are tight right now, and no, illegal activities just aren't feasible. LOL. You don't have to wipe out your 401(k) - it is not worth the hit in taxes, but is it possible to take a loan against it? (I am NOT a financial advisor - it's just a thought). And NOW is the time to sell if it is precious metals. I know someone in the jewelry repair biz and it's tough because gold costs so much right now. Take a picture of the rings and keep that, but sell them. I viewed mine as bad luck. Great writing, Katy. I like to keep things (even when they're tied to less than great memories) but like you've said, it feels so good to let go and move forward w/out them. I just received the glass pendant. It is gorgeous. I'm totally smitten. Hey Katy, You know what's best for your daughter! I think you handled it perfectly! IMO...sell them. You can't sleep in a ring, but you can a house! a friend of mine sold her blood plasma twice a week for ...i want to say...18 months? and as far as rings go- life for me has become less weighty as i've found a way to let go of the rings and other things from a past that is no longer me. but we each have to arrive at that point on our own. you'll know when that is. Interesting, i am reading this... I sold mie almost 10 months ago.. without hesitation after almost a year and a half later... cried my eyes out, but it felt so good afterwards to let it go!